So, I heard this song on my way into work today and thought it would be fun to breakdown the interaction between the officer and Mr. Carter. Let me first say, I do love hip-hop (though my preferences lie in 90’s and 2000’s hip hop) and I am quite familiar with Jay-Z’s songs and appreciate his work. I also know that the scenario laid out in the song is fictitious (there is not, to my knowledge, a 54 MPH zone) and Mr. Carter is not attempting to provide legal advice. However, I have participated in several speaking engagements with young people who inquired about the legality of Jay-Z’s responses in the song. So, here we go. It is never a good idea flee from a traffic stop. Even if the basis of the stop is not constitutional, it won’t matter if you get other charges unrelated to the original reason for the stop. Pull over and fight the stop in court. Believe it or not, courts have upheld stops for minimal speeding, even though we all know there is typically an unspoken ‘buffer’ that police will typically not stop you for. Of course, for a very marginal amount of speeding, the court may take a critical look at the basis of the speed estimation (i.e., if it was from the officer’s ‘observation’ or ‘pacing’ a small amount above the speed limit may not survive a Reasonable and Articulable Suspicion motion to suppress. Unfortunately, case law has established that Law Enforcement Officers can request individuals to exit vehicles during traffic stops. The basis of which is ‘Officer Safety.’ Failure to do so could lead to criminal charges like Resist, Delay, or Obstruct an Officer. The catch-22 is, if they believe you have now committed RDO, they can get you out of the car to arrest you, regardless of whether a Judge would ultimately believe the Officer shouldn’t have asked you to exit the vehicle in the first place. This is not necessarily true. An Officer only needs Probable Cause to search a vehicle in many cases. There are situations where only a warrant issued based on Probable Cause is required, but for traffic stops, a vehicle may be searched without a warrant under several circumstances; if there is evidence of a crime in plain sight (like open container or marijuana shake), an odor of contraband (marijuana is the most common), subject to an arrest, based on a drug dog sniff, etc. I’m glad I get to end on this one, as it is the most interesting, as far as I am concerned. Under Rodriguez v. U.S., the Supreme Court finally established that a police officer cannot detain anyone any longer then is necessary to complete the investigation of the original purpose of the stop without new reasonable suspicion of criminal activity. This means, if during a speeding stop, an officer holds you there to get a K-9 unit to the scene, and you were held longer then was necessary to complete the original purpose of the stop, AND the officer did not have reasonable suspicion of other criminal activity, then any evidence that comes from the K-9 and any subsequent search should be thrown out. Now, of course this is still pretty subjective; what is a reasonable amount of time to complete the original purpose of the stop, whether the officer really had reasonable suspicion of some new crime, what steps is an officer allowed to do during a regular traffic stop that could permissibly delay the stop, etc. But all in all, the days of being held on the side of the road for 30, 40, 60 minutes until a K-9 unit can arrive just because an officer has a ‘hunch’ are no longer. I hope you found this fun and interesting. And if you are in a North Carolina court house and hear someone belting out ‘Empire State of Mind’ or ‘Can I Get A…’ look for me. 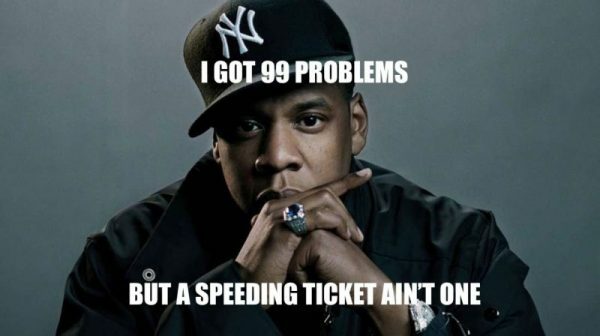 Posted in blog, Speeding Tickets, Traffic Tagged Blog, Jay-Z, NC Attorney, Raleigh Attorney, Speeding, traffic, Traffic Attorney Bookmark the permalink. Both comments and trackbacks are currently closed.